Web hosting is one of the most important factors to consider when setting up or establishing an online venture or looking for a data management service provider for your business. Web hosting not only provides you with data management services, but they also help secure your data, backups. 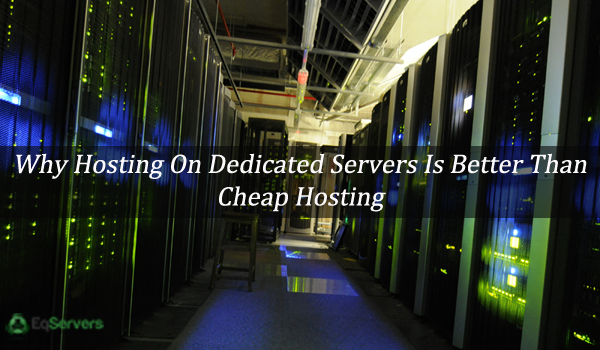 Depending on your budget and business requirements, you may however choose between dedicated servers, or cheap hosting. Just to differentiate between the two, dedicated servers provide you with hosting on a server fully committed to your business needs and yours alone. This gives you the freedom of utilizing your server the way you prefer, not forgetting that memory, speed, bandwidth and other web resources are at your convenience and advantage. Cheap hosting on the other hand mostly involves shared serves by several sites, with the possibility of congestion, low speeds, and fewer resources. As far as price is concerned, the earlier is by default more expensive to obtain than the later. But the fact and the main question remains, that one is more superior and recommendable than the other. Before choosing one guided by other business factors, there are some of the solid reasons why hosting on dedicated servers is better than cheap hosting. Yes, some people argue that cost cutting is one of the most important aspects of business, including online ventures. When investing in web hosting however, the case is actually like the consumption of cheap lacquer. In the long run, the effects you boil down back to your website. Sharing is a common property in cheap hosting, and in most cases, sites get to a point where they are congested enough to offer the required optimum experience to website visitors or users. It is in the long run better to invest in a dedicated server that will offer you maximum value for your money, with better guarantees for return on investments. As a matter of fact, what is more expensive than losing clients just because your site is not responsive or reliable enough to meet their experiential needs? In most cases, cheap hosting will offer shared IP addresses, meaning that more risks are involved in case some of the sites in the shared address get banned for illegal practices. In the world of online business today, not every other site is 100% when it comes to conforming to ethical or standardized practices and it is not so much worth it to take such a risk. Think about how intimidating it can be when your site goes down for a malpractice you were not involved in. As much as some of the reliable and highly reputable hosting providers may have a way of handling such malpractices for the benefit or the ethical clients, you can never be sure what will happen in case such an incidence sneaks through their attention. A better way to stay on the safer side of the fence is through Hosting on Dedicated Servers. Cheap hosting servers are also prone to periodic downtimes, crushes and slow speeds. Dedicated servers a better performing, more secure and provide freedom.